Well, the Opinionated Gamers is a blog that usually writes about boardgames, but we’ve been known to stray afield here and there. One of the more popular developments in boardgames over the past few years has been the Escape Room/Puzzle genre. We have played quite a few of these games, and each has a unique take on how the players get to solve the puzzles. Escape from the Room: The Curse of Old Maid Milly (Book) is another paperback book that provides you (and possibly some friends) the chance to solve a series of puzzles. While the components are slightly different – here you simply get a book; the experience turns out to be very similar to many of the games listed at the top. This particular book, interestingly enough, actually has its genesis from a real live Escape Room in the UK. https://www.escapefromtheroom.co.uk/games/the-curse-of-old-maid-milly If you want to do the real thing, it’s £75 for up to 6 people. The book is much more affordable – you can get it at Amazon for $16 or so – though as I’ll describe in a bit – it’s probably best as a one to three player activity. The book arrived in the mail on a Friday afternoon, and with the weather outside being cold and blustery, three of us decided that the day of arrival was a perfect night to sit down and start with the book. At the outset, we weren’t sure how we were going to “play” the book – i.e. all in one go or in a few sessions over the course of the weekend. We simply cracked open the book, read the instructions on the first few pages and then dove into the story. The format of the book is simple. Every right-hand page in the book has a bit of the narrative – helpfully broken up into story text and puzzle text. There is a fairly involved story line here, and I would guess that if you took all the story text and put it all together, you’d have a nice little 20-page short story when you are done. You’ll also find the description of the particular puzzle at hand on the right sided page. Opposite to this (on the left side), you’ll get some additional information – sometimes a close-up graphic of something seen on the right, sometimes it’ll be some blank area for you to jot notes, sometimes it will be additional information that you’ll need to solve the puzzle. Each right-hand page in the book has a page number on it – large and centered at the top. Underneath the page number, you will also find a helpful guide to tell you the page number where you should have previously been (in order to be on the right track). If you turn to a page number, and you did not come the place that the book tells you that you should have been – then you know that you do not have the right answer to the puzzle and you should go back to try to solve it again. Unlike the physical Escape Room (as well as some of the escape room boardgames), the path in the book is strictly linear. At each step along the way, you are presented with a puzzle, and you really can’t progress until you’ve solved the puzzle at hand and moved onto the next page in the path. There are NOT multiple options on how to work through the book. That being said, you should keep your eye out for any important details or clues as you go, as you may need those things to solve later puzzles in the book! As the back cover will tell you, the book includes over 45 different puzzles. Our group ended up playing through the whole book in a single setting. 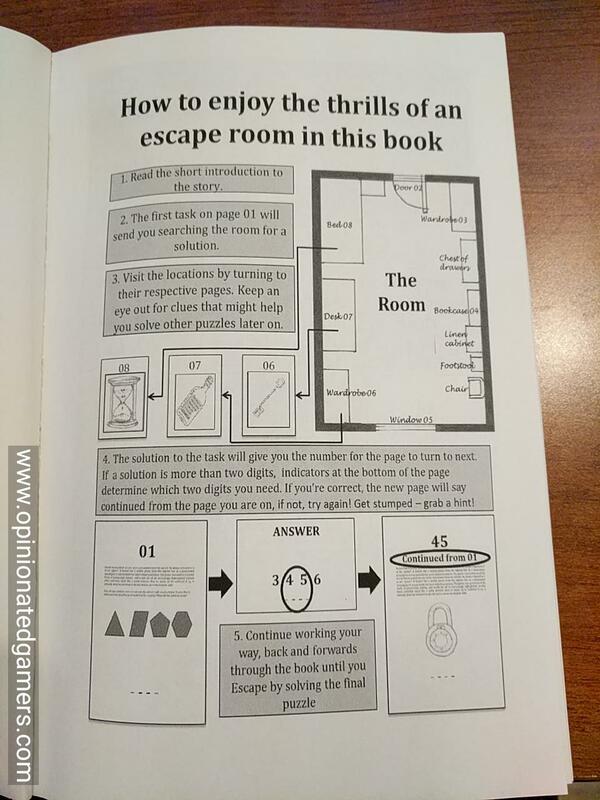 I have obviously only played it once – and like most escape room products, you will only ever be able to play this book once – but I think that this was the ideal way to do it. Some of the puzzles require you to remember details that you might have seen earlier on in the book, and we felt that it might be harder to remember if you took some time away from the book. Sure, you can always go back and look at the previously read pages – but it felt good to be able to remember those details immediately rather than have to sift through the book to find them again. We thought that 3 players was probably the maximum for this format – and that was because that was the most number of people we felt could be around the book and read it. The instructions suggest that you could play this with large groups and simply cut out the pages to lie on the table – but the conceptual problem I have with this is that if you cut out the right sided page, the back side of that sheet includes the left-hand page for the next page in the book – and you often need to have the left and the right together… sure, you could always dig thru your stack of pages to find the one that you want, but that seems like it would be kind of a pain to do. If you cut out the previous page, then you’d have to search for this close up of the cat quilt when you needed it! The puzzles themselves are of varied types, and for us, the difficulty was easy to moderate. There is a website that is referred to on the top of every left-hand page which offers hints for the puzzles in case you get stuck, and we did need to refer to this for a single puzzle. Otherwise, we were able to get the correct solution on our own for the rest of the puzzles. I will say that the hint page is less than ideal. There are two hints offered for each puzzle, but EVERY hint is listed on a single web page – so you go to the page and then you manually scroll up and down to get to the hint that you need. The downside is that it would be quite easy to inadvertently read a clue for a puzzle that you haven’t yet seen (nor need the hint for!). Given that web page generation isn’t that hard, I would have much preferred each clue to have a separate page so that you didn’t spoil anything by accident. My other comment on the hints is that they generally weren’t needed because the book included way too much hinting in the text on the puzzle. Many of the puzzles had emphasized words in bold or italics to help direct people to the solution of a puzzle – and IMHO – this is un-necessary to have in the text itself. Many of these instructions would have been much better served to be the first hint offered on the website. We felt that there were a number of puzzles that might have been moderately difficult to solve that were instead instantly solved by an unwanted clue/hint in the text that we had no chance to avoid. Now, take this criticism with a grain of salt, as all three of us are fairly veteran puzzle solvers – both escape room and other paper-and-pencil puzzles. 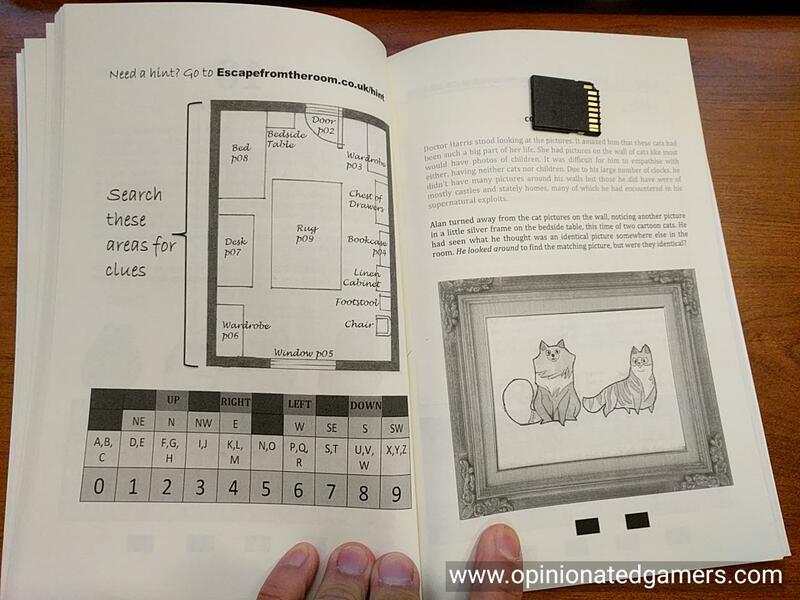 I think that the hints in the book text make the puzzles accessible to just about anyone – but, again, it doesn’t make sense to neuter them for those looking for more challenge, especially when you have an online hint system already set up. One other thing I wish the book had was a better numbering system. As you play the game, you will discover that the right handed pages are numbered sequentially, starting at 1 and going to the highest number. After you solve a few puzzles, you will get a feeling for how many pages there might be in the book – and this fact turns out to be a clue to use in solving puzzles… Once we figured out that there probably weren’t more than 75 pages in the book, we pretty much knew that all our answers would never start with the letters S or later in the alphabet, nor any directions involving South – because there wasn’t a page number to support that answer! I think that book could be improved by simply using the full four digit answer as the number on the top of a page. As long as the pages were still in ascending numerical order, you could continue to flip thru the pages to see if you had a match to your four digit number. If you didn’t find a page with the number, then you know you have the wrong answer! And, since we’re talking about the page numbering system – I would have really preferred the pages to also be indexed in the top right corner – so that I could try to limit revealing any extra information while I flip through the pages. It would also be nice to have the “continued from…” info in a different place, say the lower left corner – again to stop you for accidentally learning information. With the current format, you pretty much have to open the book fully to see the page number in the top center of the page, and that often allows you see stuff that you maybe shouldn’t have seen…. Especially if you had the wrong answer to the previous puzzle! Despite the above quibbles, we actually had a engrossing time with the book. We ended up playing all the way through – well with some breaks to prepare and eat dinner as we played – and at the end, we all agreed that it was an enjoyable experience. We would have preferred the puzzles to be a bit more difficult – or at least not clued so much in the text – but even with that, we had a lot of fun solving the puzzles. We also enjoyed the development of the story as we progressed through the book. As I said earlier, there is quite a lot of story, so you also get a decent short story out of it too! The story can be a bit macabre, so you may want to consider that when playing with younger kids – but my guess is that kids that are old enough to be able to help solve the puzzles in the book should be OK with the story line as well. For a first book, it’s a decent effort, and one I am glad to have tried. It appears that there is a second version in the works, and I’m interested in giving that one a go as well based on our run through the first one. I just hope that it can be made a bit more spoiler proof. Like every other escape room book or game that I’ve played, Escape from the Room: The Curse of Old Maid Milly is no substitute for the real escape room experience – but, it provided us with an enjoyable evening together, comparable to the other escape room games that we’ve played. Craig V: Although I have quite a bit of experience with of real life escape rooms, escape room apps, and escape room card/board games, the idea that there were also escape room books never occured to me. Strange, I know, especially considering that puzzle books have been around for a long time. Now it seems obvious that there would be escape room books available and knowing that now has opened opened up an entirely new variety of games! Escape from the Room: The Curse of Old Maid Milly was my first book-based escape room experience. I wasn’t sure what to expect and can only really describe it as a story, choose-your-own adventure, and puzzle book all combined into a somewhat new type of gaming experience. Did it work? Was it fun? The concept and idea is really intriguing, but this adventure left me thinking that it could be better. Book format – A moderately-size book is the perfect thing for use while travelling. There are many escape room games available that have minimal components or a single deck of cards, but it’s never fun having to pick up that mess when the deck accidently gets dropped or mixed up in a bag. A single book is easy to pack and easy to handle while playing, especially if riding in a car, train, or plane. The book format also makes it easy to play while on the couch, in bed, or in a canoe! It’s inexpensive – I believe that the sweet spot for many printed (e.g., book, cards, or board game) single escape room adventures is $15-ish. This book hits that mark and definitely provides a lot of puzzles and playtime for the relatively low financial investment. Puzzle variety – There is a decent variety of puzzles in the book, but some are repetitive. Maybe it isn’t necessary to have over 45 different puzzles if several of them are the same type. It was fun to explore what was possible with just words and images spread across pages of a book. Separate story text and puzzle text – The book attempts to distinguish between story text and puzzle text by printing the story text in a lighter color. The shade of gray used for the story text is too light causing the printed words on the page to be fuzzy and more difficult to read. Perhaps the story text should have just been italicised or inside a box if the intention was for it to be differentiated. However, it’s not really clear why there is even an attempt to separate the story text versus the puzzle text because reading both are necessary to play the game. The story text provides the context of the game (e.g., the description of the environment and objects, actions being taken), and the puzzle text is trying to help lead the player along. In some cases, the story text includes some puzzle information that isn’t actually printed in the puzzle text format and in other cases the puzzle text is is highlighted, but in the middle of a huge block of story text. It’s not really possible to completely skip all of the story text while playing the game (I actually tried doing this for several puzzles), so why not just print all of the text in the same format and let the reader/player distinguish what is important? 100% linear game play – Only one puzzle is presented at a time and it must be solved in order to progress to the next. The entire story progresses this way, so it’s impossible to work on multiple puzzles at the same time. Clearly, this was the intention of the author since the gameplay like reading a story one page after another, but the pages are out of order and getting to the next involves solving a puzzle. However, the book and story format really ends up limiting the adventure to solo play or for no more than two players sitting close together. The reality is that only one person can really hold and flip through the book at a time and only one puzzle is available at any given point. 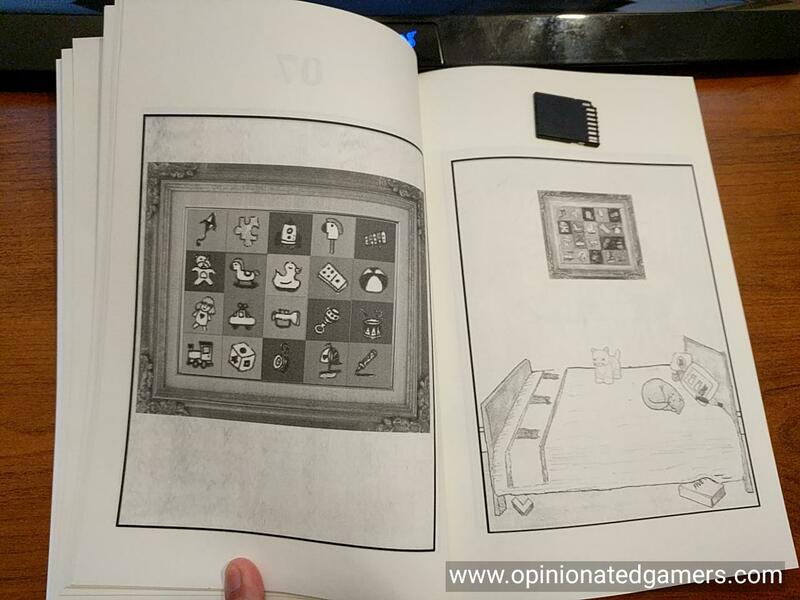 The introduction/instruction page mentions cutting “the illustrated pages of the room out of the back of the book and spread across the table for all to see” (the exact pages needed are not specified and they aren’t at the very end of the book) to facilitate multiple players, but that doesn’t fix the problem that only one puzzle can be worked at a time. I suppose one person could be reading the story and puzzle out loud while the others look for or figure out the answer. That may work, but the puzzle difficulty is easy to moderate overall, and none of them really require much effort to solve due to excessive clues provided. It’s not clear that there’s really enough here to fully engage a large group of people. 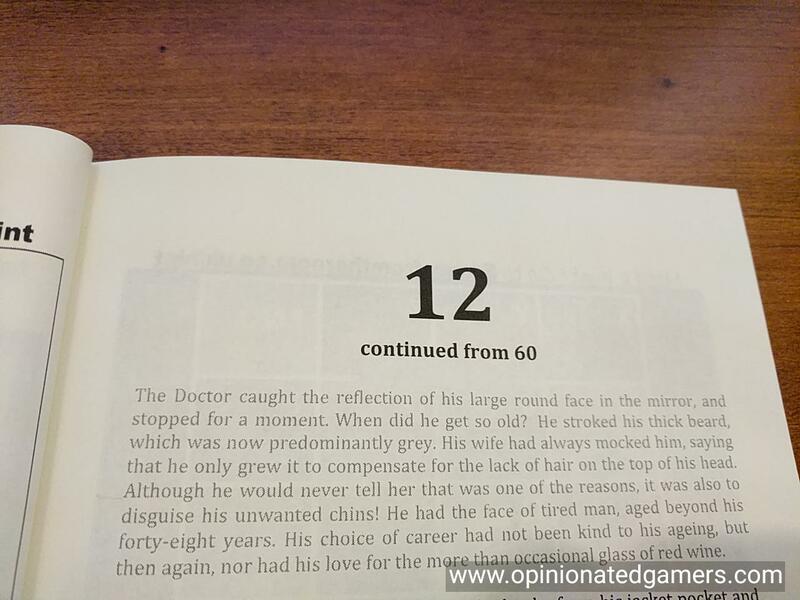 Page numbering – The page numbers printed on the book pages are in the top middle rather than in the upper right and/or lower right corner of the page like many standard books. Changing the location of the page numbers would make flipping through the pages to find the number easier and less susceptible to providing too much extra information by mistake. The page numbers are also limited to two digits. 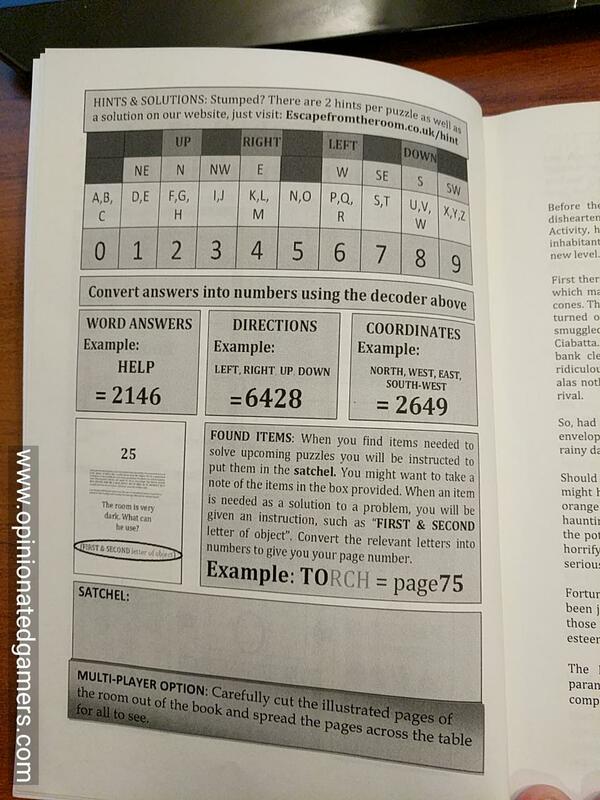 It’s easy to figure out the possible number solutions because a large chunk is used at the very beginning, discovering the upper end occurs quickly (or before event starting if the decision is made to find and cut out the unspecified illustration pages from the book for the multiplayer option), each page number is only incremented by one, and all of the pages are in sequential order. This matters because knowing the range makes it easier to figure out solutions since many possibilities can be quickly ruled out. Artificially limiting the page numbers to two digits also makes it necessary to define which two digits are important when a puzzle solution contains more than two numbers/characters. Many puzzles do have solutions larger than two digits and because only two of them actually matter, it’s actually possible to just skip/ignore figuring out the other parts of the solution since they aren’t going to be used anyway. It doesn’t make sense to include puzzles that only need to be partially solved to successfully continue. Regardless of whether the solution is two, three, four, or whatever number of characters in length, the page numbers could have been the full solution and ordered in an appropriate order in the book (e.g. ascending numerically overall or ascending by first digit only, etc. ), even if a significant amount of number would ultimately be missing. Maybe this introduces another problem for the story or puzzles, but at least it would force players to completely solve a puzzle in order to continue to the next. Online hint page – Hints are provided on a single web page in one large list. The format of the page is not ideal as it’s too easy to see extra information, even if not trying to actually cheat. The web page could be dynamic whereby the book page number is input on the web page and then the first clue is provided with a button to reveal the next clue and so on. All of the hints on a single generic web page also become problematic if other books are added to the series and the same URL is provided. However, it’s not clear why the hints weren’t just included on a few extra pages in the back of the book (especially given their current format on the web page). That would make the hints available for people playing on an airplane or other location without access to the Internet. Another idea would be to spread them throughout the book at the bottom of all the pages, but printed upside down or something. There were times that we found it difficult to want to finish this book. The story dragged on a bit too much, the puzzles started feeling repetitive (e.g., so much counting! ), and the fun factor seemed to be just out of reach. Reading through a written description of the actions that players would be making in the real version of this escape room didn’t translate well since it ultimately just becomes a string of puzzles inserted into a story. Maybe I was hoping for something more innovative or complicated, or maybe I’m just not the target audience for this book, or maybe I’m just being too critical. Regardless, I would love to try the real escape room version of this story as the description of it throughout the book sounded really good. Despite my reservations about the format and mechanisms of this particular escape room adventure book, I do recommend giving Escape from the Room: The Curse of Old Maid Milly a try. It’s a great value for three hours of playtime, a good introduction to escape room games/puzzle games, and the combination of story, puzzles, and portability creates a unique experience. It also introduced me to an entirely new format of escape room games, and now I will definitely be on the hunt for more books to play!